Today we are presenting yet another rare find: an article about the SES., which Pierre de Lasenic wrote for the private occult encyclopedia of Universalia. Information about this very enigmatic society, even in today’s world of the internet, and information overload, is practically non-existent, which makes this find even more interesting. Universalia’s encyclopedia, is collection of free leaves, which are sorted alphabetically in a paper box. Articles were written by various authors, who were members of Universalia, and even though the articles were anonymous, given the context , writing style, and other materials that were found, such as handwritten notes, we can now say with absolute certainty, that among the authors, and students of this encyclopedia, were also Franz Bardon and Jan Kefer. The initials are of an unknown origin, yet behind them is hiding an Egyptian Society called, Haka Suteh – with the literal translation meaning, “The city of Seth“, and symbolically meaning, “The one who resurrects“. 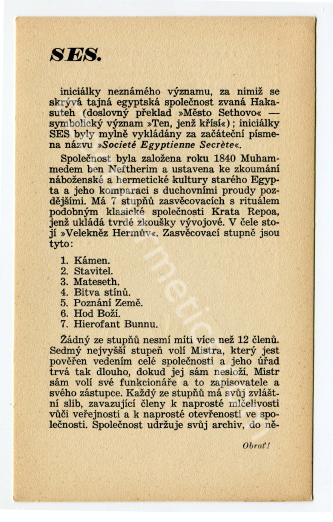 The initials, SES, were mistakenly explained as the initial letters of the name “Societe Egyptienne Secrete“. The society was founded in 1840, by Mohammad bin Nefther, and was established for research of religious, and hermetic culture of ancient Egypt and its comparison with the spiritual currents of later periods. It has 7 initiatory degrees, with ritual that is similar to the classical society of Crata Repoa, and sets up difficult developmental tests for the initiate. It also has a “Grand Master of Hermes” as its leader. Neither of those degrees are allowed to have more than 12 members. The seventh, and the highest degree, votes in the Master, who is responsible for managing the whole society and his task lasts as long as he does not abdicate. The Master, himself, votes in his own functionary, that being a secretary, along with his own representative. Each degree has it own vow, binding the members to absolute silence toward the public and complete openness within the society. The society itself, has its own archive, where every single one of the members contributes his inheritance – material or mental – along with archiving all experimental works of the member, together with notes and assessments of those who conducted the experiments. Considering the fact that this society, next to the New Eulis, and H.B. of L. is one of the most secret existing societies, there are many recorded instances, where so called “occultists” pretend to be members, in order to gain respect for themselves. Membership is conditioned by high standards of personal qualities and personal initiation in the maternal lodge, which is outside of Europe. The society publishes a magazine twice a year for its members, called, “Cycles”, which published “Initiatory Legends of the SES” and the reconstruction of the “Egyptian Book of the Dead“. In current times, the headquarters were recently founded in London. 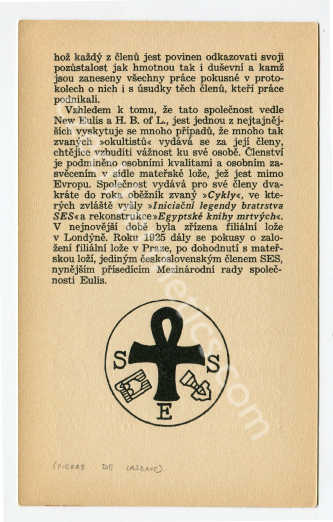 By the year 1925, there had been attempts to found a branch in Prague, after an agreement with the maternal lodge, and the only Czechoslovakian member of the society is the current assessor for the International committee of the Eulis society*.